The common thread between the five featured houses on Old Island Restoration Foundation’s February Home Tour is that they have virtually nothing in common. Nothing. But then, diversity is the hallmark of OIRFs invitation to Key West homeowners to ensure the carefully selected properties offer tourgoers a wealthy range of architectural history and decorative insights. 1. 1401 White Street: Influenced by the American Foursquare-architectural style. The all-brick two-story structure was probably built in the 1920s. It still showcases original stained-glass transoms, but during a recent renovation, the interior staircase was rebuilt and repositioned in the first floor’s open-living area. Its new iron-and-brass railing was gold-leafed to capture a sense of the ‘30s Art Deco. Nothing like it around town. 2. 810 Pearl Street: A vividly colorful take on the Historic District’s dominant two-story Classic Revival design. Every shade of blue and green coats shutters and floors, walls and ceilings. But much of the original 1890s Dade County pine’s rich browns are still in place, accenting more than the renovated structure; a wealth of local artists’ works is also wrapped in warm-wood tones. 3. 1104 Petronia Street: Also an 1890s two-story Conch house, but its architectural configuration and decor is an uncommon time capsule of 125 years of island life. Although some add-ons and upgrades occurred over time, the mostly original structure features five generations of heirlooms, photos, China and an amazing genealogy nook. 4. 904 Olivia Street: Beautifully modernized with nothing of its 1890s pineapple-farmer’s-barn roots visible in its open kitchen-living area. Yet, amidst the hi-tech appliances and lighted-and-slatted stair treads handmade by the homeowners, a wall of wood on the first floor was salvaged from the Dade County pine-roof material tossed during the new City Hall reincarnation from Glynn Archer School. 5. 618 Petronia Street: A visionary take on a non-contributing house to the Historic District that was formerly some stucco over cinderblock, part Dade County pine, narrow halls and add-ons from the 1940s and ‘60s. Homeowners turned their “Frankenstein house” into a contemporary jewel. 6. 511 Eaton Street: Note! Tickets are not available for purchase at this location. Hours will be 11 am to 5 pm both days. The Old Town Manor is the bonus 6th property. An elegant hotel mansion steeped in history and spirited tales of yore offers tourgoers treats and R&R at the end of the tour. Tickets are $35 in advance, $40 on tour days. For credit card purchase, buy tickets online HERE or at the Oldest House (322 Duval Street, 10 am to 4 pm, closed on Wednesday and Sunday). During tour hours, tickets will be sold at the featured houses – cash or check, please – or PAY BY CREDIT CARD AT HOMES #1 AND #2. If you are walking, houses may be viewed in any order over the two days between 10:00 am and 4:00 pm. 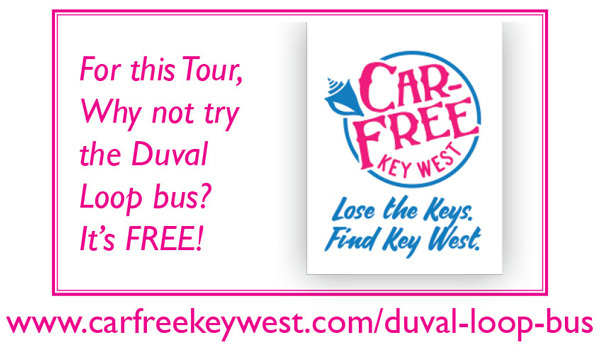 Also note that the free Duval Loop bus provides convenient access to most of the homes. No smoking, pets, food/drink or photographs will be permitted in the tour homes. OIRF is a 501(C)(3) nonprofit organization dedicated to the preservation of architectural treasures in the City of Key West and the celebration, honor, and recognition of the historical achievements of the Island. Funds raised from the tours will be used for the Foundation’s grants program and other endeavors furthering our preservation goals.